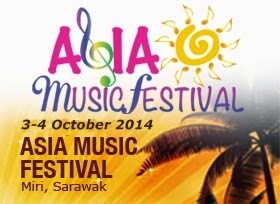 Most of you already heard the news about Asia Music Festival 2014. Same as last year, the huge event will be held at Eastwood Valley Golf and Country Club, Miri, Sarawak. I attended the 2013 edition of AMF and it was AWESOME!! People are dancing and having the time of their life! From my personal experience of last year's AMF, I find that this particular event does not focus on 1 specific genre of music. It can be instrumental, rock, dangdut, and etc. That is what makes this event different from Borneo Jazz Festival, RWMF and so on. The line up for this year performance consist of 4 performers from Malaysia, 1 from Singapore, 1 from Thailand, 1 from India, 1 from Indonesia, 1 from Philippines and 1 from Taiwan. Now, looking at the list of performers, its gonna be one hell of a night peeps! Will tell you guys more details on the performers and the price rate for the tickets in my next blog!